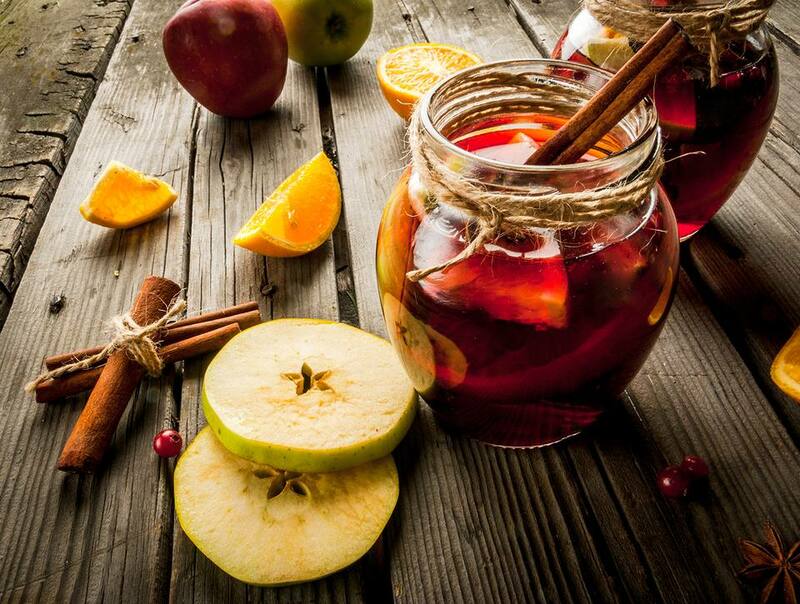 Sangria is a drink made with red wine and fruit. The word "sangria" is Spanish for "bleeding." The drink originated in Spain. Sangria is served in a pitcher and has become very popular in the U.S. According to The Encyclopedia of American Food and Drink, the drink's popularity began after it was introduced by Alberto Heras at the 1964 New York World's Fair. This version is a festive holiday sangria made with cranberry juice, orange and lemon slices, and Port wine. Thread the fruit onto small skewers or toothpicks so each guest will have a few pieces of fruit in their glass. Thread the fruit pieces onto skewers, if desired. Combine all ingredients in a large jug or bowl and refrigerate for at least 3 hours to chill and allow flavors to develop. Add ice to a pitcher and add sangria. Serve the sangria in wine glasses. Add strawberry halves, peach slices, or large fresh blueberries to the skewers. Replace two cups (16 ounces) of the cranberry juice with orange juice. Add a few cinnamon sticks to the sangria. Add a thinly sliced apple to the sangria. Add 1/2 cup of fresh cranberries to the sangria. What Country Did Eggnog Originate From?